WHALES EAT PEOPLE — DON’T THEY? 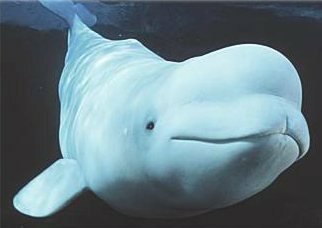 A few months ago, Charlie shared a story about a woman swimming naked with Beluga whales (white whales). Apparently, untamed white whales freak out when they sense objects around them (scuba gear, synthetic materials, etc.) — I’m not exactly sure what freaks them out as various news reports published different triggers. Anyway, scientists, animal experts, and other important people figured out that untamed white whales are completely OK with a naked woman (completely naked) swimming with them. In addition to stripping down to a birthday suit, the water is freezing cold and humans can’t be in the water for a long time (about five minutes). I told Charlie that I could never do something like that because I would be too afraid the whales would try to eat me. I do not want to be a tasty snack for a whale — no thank you. Charlie tried to convince me that white whales don’t eat people, but I don’t believe him. Swimming naked in freezing water is not a problem for me — not that I’ve ever done that in my life. But I’m from the Midwest — I like the cold weather. Swimming naked might not be the brightest idea, but I would do it for a really, really, really good reason or $1 million — maybe half a million. I just won’t swim with untamed white whales because I don’t want to be an appetizer for them. Unless people can 100% guarantee my safety with the white whales, then I would consider swimming with them. Ah, who am I kidding? I’d probably do it as long as 100 people promised me the whales wouldn’t eat me. I love animals. Even though whales might not be small or cuddly, they are beautiful animals — from a distance or behind a glass wall. To swim with a non-killing human whale would be lifetime opportunity even if that meant getting naked and swimming in freezing water. I just don’t quite believe that untamed whales won’t try to eat a complete stranger. If I can be convinced and absolutely certain that I will live through the experience and share my story with anyone who would listen to me, then I will swim with an untamed white whale. Could I also name the whale? I love naming animals.